For the first time, here is the complete history of the International Finance Corporation (IFC). In the fifty years since the end of World War II, the world of development finance has grown rapidly. One of the many financial institutions which cropped up to help war-torn countries with their reconstruction was the IFC. 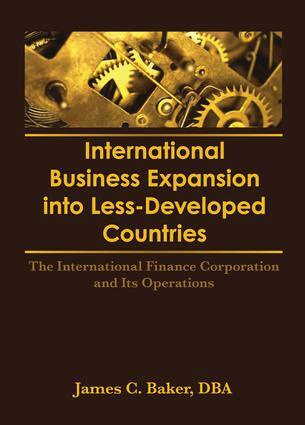 International Business Expansion Into Less-Developed Countries examines the success of the IFC in its wide variety of public sector development activities. Covering thirty-five years of IFC operations, the book thoroughly evaluates the formulation of the concept of the IFC and its evolution as a viable global development finance agency. It is the most complete and up-to-date treatment available of the IFC. The administration and operational procedures are described in detail as are case examples of financial development in all regions. Problems encountered by the IFC and new and future activities of the IFC are discussed. Scholars of economic development and international finance will find the unusual way in which the IFC was established and the case examples presented a highly valuable reference, as will students of international studies and organizations.